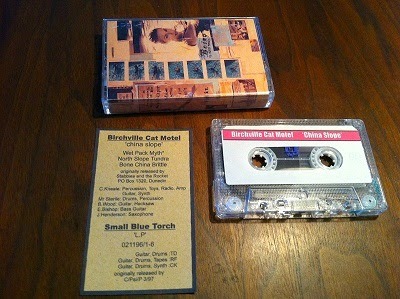 Bleak Bliss: Birchville Cat Motel / Small Blue Torch ‎- China Slope / L.P.
Birchville Cat Motel / Small Blue Torch ‎- China Slope / L.P. Here's another Kiwi conundrum. The original China Slope was a 12" lathe cut LP released on Stefan Neville's (I think) Stabbies And The Rocket Recordings in 1998. This contains an additional track "Wet Pack Myth" which I don't think appears anywhere else. The Small Blue Torch contribution is a bit of a mystery but the the recordings are from November 1996 ... is this another otherwise lost New Zealand lathe? This is a C90 released on Campbell's Celebrate Psi Phenomenon. Is it 1999? 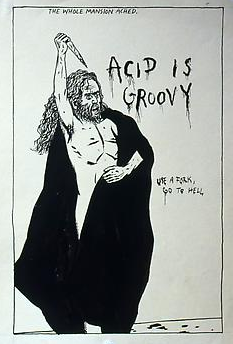 Loving all the obscure NZ stuff. Would love to see more BCM stuff, esp the CD-r stuff that came out on celebrate psi phenomena. From the label owner: "It's a reissue of Stockpile and Full Fathom Five. Bandmembers met at a urinal. What else do they need to know? Reading this sure does bring back memories of learning ways NOT to design & publish a 2CDR set... although I guess it worked out okay. Good music either way, I'm gonna listen to it again tonight!" you posted in these days!